We meet on the last Tuesday of every month except December at 7.30pm in the upstairs board room at St Mary’s Parish Social Club, West St, off Devonshire Road, Chorley, PR7 2SR. Membership is £25 a year, or £5 per meeting. Meetings with guest speakers may charge a higher entrance fee for non-members. Chorley & District Writing Circle was formed 2002 with the support of Chorley Borough Council and funding from the National Lottery. The inaugural meeting was held at Chorley’s historic Astley Hall – for many years a room at what is now The Coach House was our meeting place. The Circle immediately attracted a number of local writers and was able to hold a very successful Literary Festival in venues across the town. They published the first anthology of members’ work in 2005 in a booklet called Aware. It proved extremely popular and a new edition has been published most years since. In 2008 the Circle held its very first writing short story competition. The group that year attracted a number of respected authors to come and speak at meetings including Cath Staincliffe (crime novelist & screenwriter of ITV’s Blue Murder) and Joseph Delaney (best-selling author of the children’s series The Wardstone Chronicles). 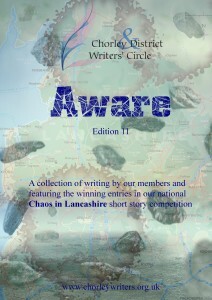 Towards the end of 2008, Chorley Writers won a second Lottery grant to fund the latest edition of Aware, a Lancashire-wide poetry competition and to set up a new website to encourage local people to take up creative writing. The following year the Circle launched its most ambitious project – a national short story competition. Entries came in from across the UK and many were published in Circle’s first ever digital edition of Aware. We’ve held national competitions every year since 2010 (except 2017) . In 2013, we accepted sponsorship from local indie publisher Open Circle so we could stay at The Hartwood, at the time our preferred venue for meetings, and for that the Circle owes a large debt of thanks to DJ Harrison, author of Due Diligence and other crime novels featuring Manchester girl Jenny Parker. Our sponsor for 2016 was Eye Designs Opticians, a family-run eye care practice, caring for your eyes with courtesy and expertise. In 2016 we adopted the Preston Branch of Cats Protection as our designated charity. Our sponsor for 2017 wished to remain anonymous. In 2016 rising costs led us to a change of venue: the very convenient St Mary’s Social Club off West St, Devonshire Road, Chorley. West St car park, free in evenings, is adjacent and it’s a 5-10 minute walk from Chorley bus and train stations. In recent years, we’ve been thrilled to welcome some fabulous speakers including short story writer Claire Massey, crime writer Martin Edwards, graphic novelist Michael Barrett, poet Carole Baldock and novelists Rosie Garland and Carys Bray. We’ve taken part in the Council-run event, What’s Your Story, Chorley, every year since it began, and in November 2014 we launched Write Now, our first ever public event, with speakers including a literary agent, publishers and author Carys Bray. In 2015 we followed this up with another Write Now held at Chorley Library. This time we welcomed back Cath Staincliffe and also enjoyed listening to Robin Jones of Unthank Books as well as holding a very successful Short Story Slam, open to writers throughout Lancashire. The winner, gratifyingly, was Circle member Cathy Lennon. Our 2016 Wnite Now event was held on the October 22nd 2016 in St Mary’s Parish Centre, Chorley. We welcomed speakers children’s writing specialist Jake Hope, author Alan Wright, Katherine Armstrong, commissioning editor from Bonnier Zaffre and author Zoe Sharp. The 2017 event starring Laurence O’Bryan and Wendy H Jones was held on November 18 at the same venue. Our 2018 Write Now event is scheduled for Saturday November 17 2018 and will feature diverse publishers. An anthology of Circle members’ writing. Aware edition 11 (2015) is a substantial booklet and we’re pleased to be able to offer it in printed form, available from www.lulu.com. The price is £6 plus postage, with a donation from each copy sold going to the Circle’s chosen charity for 2015/2016; Cats’ Protection. Use the link below to buy Aware. Aware is also available free of charge to download.